Every issue of Ice Cream Man makes me wonder if I am reading a comic book in a dream that I’m in. This fifth issue is another beautiful, sad, and bizarre entry of this series. W. Maxwell Prince is leading us down a strange and exciting path with this series. I have no idea where this path is ending but I am not at all worried about it because the traveling is extremely fun. 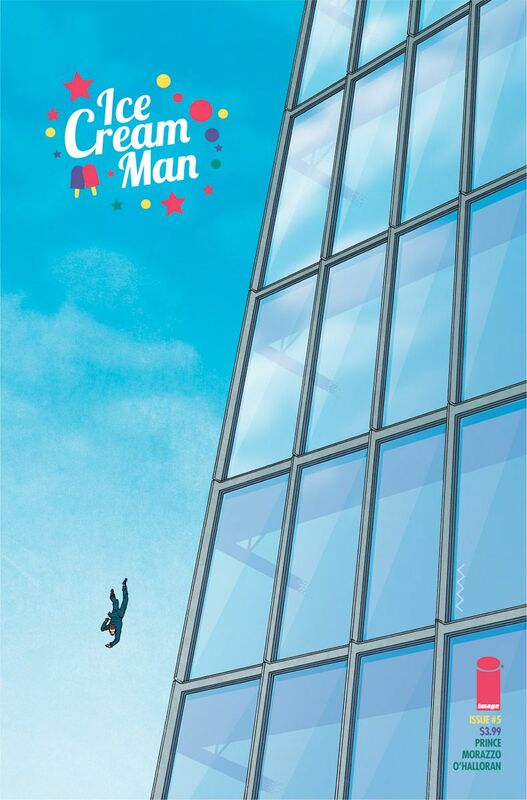 This issue goes back and forth between a falling man who has jumped off of a building and an employee who works in the building who is also trying to maneuver her way through some pretty strange things to escape it. We get to follow the falling man’s thoughts as he falls while also following an unknown person’s narration of the escaping employee. And once again we leave the issue with questions about one of the two mysterious figures who randomly appears in whatever story the issue follows. I have so many questions with no desire for answers because I absolutely love the chaos Prince is writing. He manages to create an issue full of wonder and horror so beautifully that it is impossible not to appreciate his talent. Artist Martin Morazzo is a major component in this pandemonium by illustrating artwork that is perfect for what the story calls for. I can’t imagine having to create the visuals for Prince’s ideas for this series but it doesn’t seem to be a problem for Morazzo. His artwork, along with Chris O’Halloran’s colors, is incredibly detailed and strange, which adds a level of fear while reading the comic book. The panels and whole pages of vast hallways and stairwells are beautifully done. We get a taste of what the issue has to offer in these scenes with the amazing cover these two artists created.